Each of the residents at 23 Beulah Grove, a grimy south London bedsit, has a secret to hide, one of them even more than the others. Alex Marwood’s latest crime thriller brings them all together with a serial killer over the course of a sticky summer with devastating consequences. Teenage runaway Cher, asylum seeker Hossein, the secretive Collette, CAB employee Thomas, the mysterious music teacher Gerard and beleagured sitting tenant Vesta are a disparate group of tenants living in a run-down house under the beady eye of their grubby, grasping landlord Roy. The book begins with an injured Cher being interviewed by the police in the aftermath of something terrible, doing a pretty efficient job of hooking the reader in to find out what the hell happened. Next, we revisit the events which led Collette, the newest resident of no.23, to spend three years in fear of her life. Collette’s arrival at no.23 is a catalyst – when she moves into a room still containing the belongings of the previous tenant, despite her intentions to stay anonymous, she becomes part of the house’s community. Alex Marwood manages to capture perfectly the nature of London’s transient population in the fact that the previous tenant’s unexpected disappearance sparks little more than a few phone calls from fellow resident Cher. As with last year’s The Wicked Girls, Marwood has created a group of richly-drawn characters who inspire admiration, annoyance and sympathy in the reader. Cher is by turns infuriating and pitiable while sitting tenant Vesta has become a prisoner of her own tenancy – hating her home but refusing to leave. I would have liked to read more about Hossein; his reminiscences of his missing wife were touching and particularly lovely. I really think Marwood has a great talent for sympathetic and engaging personalities but without shying away from showing the darker side to their natures when it’s needed (see also Amber in The Wicked Girls). She’s also very good at capturing the underbelly of life – the poverty and desperation of no.23’s residents is juxtaposed with the unidentified residents of the house next door which has been done up by a middle-class family getting ahead of gentrification. There is a certain amount of gore in The Killer Next Door so be warned. There are some passages which are definitely not for the faint-hearted. It isn’t your typical crime thriller either – it’s driven by the characters who are unknowing witnesses (and at times accomplices) to some horrifying murders. I also liked the fact the police weren’t presented as perfect and all-knowing (quite the opposite) and the residents were left to deal with things themselves. 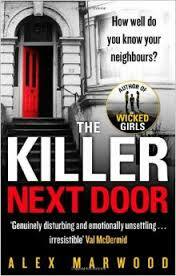 Yes, I know it’s a cliché to say, but The Killer Next Door is a proper page-turner. When I’d finished it, I wanted to go and read it all again. The Killer Next Door is available in Kindle format now and paperback in June 2014.